The chillies are hot and the mariachi band is booming, it's time to crack open the pinatas! Click here to play! 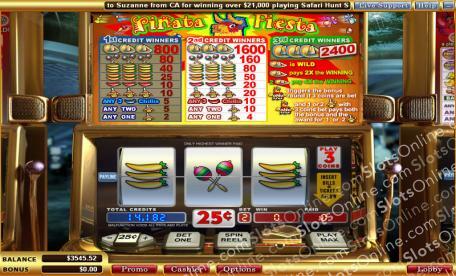 Play Pinata Fiesta today for one of the most exciting slots experiences available online. This traditional machine is played over three reels and a single pay line. Single, double, and triple chillies will pay out remarkably well, but the Sombrero symbol is Wild and will pay up to 2400 times your original wager. If you manage to spin up the Bonus Pinata symbol you will be sent to the Bonus Round, where cash awaits inside of the pinatas rather than candy. Pinata Fiesta is a simple game that is extremely easy to pick up and will have you coming back for more time and time again. Play this traditional slot today for your chance to win big. Smash the pinatas and earn yourself the jackpot! The Sombrero symbol is Wild. Not only will is play into winning combinations, but also offers odds of up to 2400:1. Spin up the bonus symbol, the Sombrero, for your chance to enter the Bonus Round and win big!